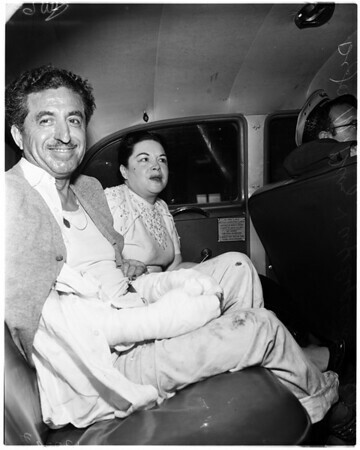 Burn victim (fire in apartment), 1958. Caption slip reads: "Photographer: Wyman. Date: 1958-01-12. Reporter: Cowles. Assignment: Burn victim 2070 North New Hampshire. 69-70: Doctor Jose M. Diaz, 55 (victim) & wife Esperanza. 57-58: Esperanza Diaz (daughter), 19 years, amid burned bedding. She saved her father from burning".